TULSA, Okla. At the time it premiered, "Twister" put forth a fantastical science fiction idea: Release probes into a storm in order to figure out which tornadoes could develop into killers. It's no longer fiction. Oklahoma State University researchers are designing and building sleek, Kevlar-reinforced unmanned aircraft  or drones  to fly directly into the nation's worst storms and send back real-time data to first responders and forecasters. "We have all the elements in place that make this the right place for this study to occur," said Stephen McKeever, Oklahoma's secretary of science and technology. "We have the world's best natural laboratory." Tornado survivor: "I thought we were going to die"
Which states' homeowners are most at risk for hurricanes? Oklahoma is the heart of Tornado Alley, and has emerged battered, yet standing, from seven tornadoes with winds exceeding 200 mph  tied with Alabama for the most EF5 storms recorded. The May 20 tornado in Moore that killed 24 people was one of them. The federal government's National Weather Center, with its laboratories and the Storm Prediction Center, are appropriately headquartered in Norman, but research is done statewide on Earth's most powerful storms. If all goes as planned, OSU's research drones will detect the making of a tornado based on the humidity, pressure and temperature data collected while traveling through the guts of a storm  critical details that could increase lead time in severe weather forecasts. The drones would also be equipped to finally answer meteorologists' most pressing questions. "Why does one storm spawn a tornado and the other doesn't, and why does one tornado turn into an EF1 and another into an EF5?" asked Jamey Jacob, professor at OSU's School of Mechanical and Aerospace Engineering, which is developing the technology. The drones could be operating in roughly five years, designers estimate. But there are limitations on immediately using the technology, including current Federal Aviation Administration rules that mandate where and how drones can be safely launched in U.S. air space. The agency's regulations also require operators of such machines to physically see the aircraft at all times, limiting the range to a mile or two. Developers are seeking to get the same clearances as the military, where operators don't have to see the aircraft at all times and can view data beamed via a satellite link. The machines  which weigh up to 50 pounds- are safely controlled by operators with a laptop or iPad, cost a fraction of manned research aircraft and are more reliable than sending up weather balloons to divine a storm's intentions. In its simplest form, a weather drone would go for about $10,000, researchers said, but models with more extensive storm-detecting equipment  like having the ability to drop sensors as it flies through a storm  could run $100,000. Jacob started researching the need for such aircraft more than 20 years ago while an undergraduate at the University of Oklahoma, and arrived at OSU about seven years ago to continue his research. As a native Oklahoman with a long-held interest in the weather, developing the perfect storm-savvy technology has become a passion for him. "Technology has really been catching up to what we wanted to do," he said in an interview. And in the future, the drones could be used to monitor wildfires and send back information to firefighters so they don't get outflanked by the blazes or they could fly over farmers' crops to relay enhanced pictures of how well they are growing. One of the storm models was supposed to have its test flight on the day of the Moore tornado. It was delayed by two days  to great success. 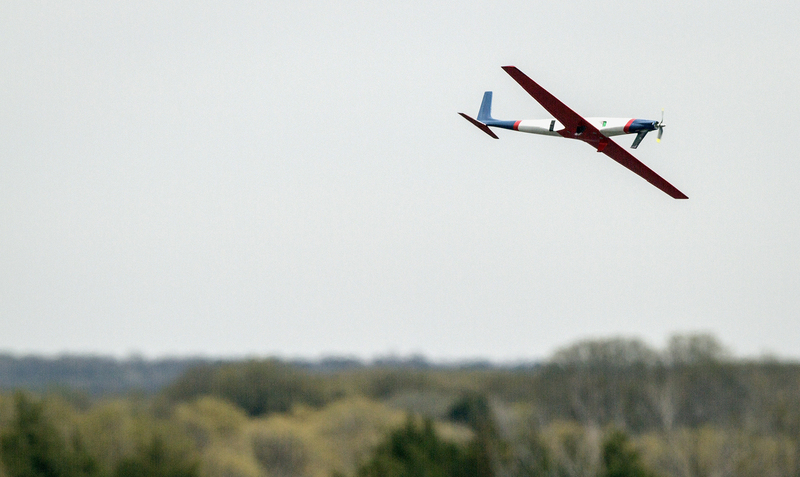 Immediately after, OSU researchers posted a video of its flight on YouTube. To researchers' dismay, drones have developed a negative connotation lately, as some groups concerned about civil liberties strongly question the Obama administration's use of armed Predator drones overseas as well as privacy issues. So, the weather researchers prefer "unmanned aircraft" to describe what they are working on, even though the word drone is also accurate. "It's so sad to me because I see the negatives people are always talking about, that it's going to be a Big Brother surveillance system and the government is actually going to worsen society rather than benefit society, and our goals are the exact opposite," said Jacob Stockton, a master's student at OSU who is working on the project. "It's extremely rewarding to take the perspective that my work is being poured into helping others to avoid the tragedy that happened" at Moore, he said.